The second in our series on South Africa’s cultures, looks at the traditional dress of the Ndebele, who are particularly well known for their beautiful bead work and colourful wall paintings. Ndebele woman take great pride in their dress. Their traditional dress is colourful and bright and is decorated with a lot of beautiful bead work. A woman’s traditional dress shows her age and status in the community. A married woman traditionally wears a blanket over her shoulders with a lot of thick beaded hoops of twisted grass, called “isigolwani” around her neck and legs. She also wears copper and brass rings or “dzilla” around her arms, neck and legs. The blanket or “nguba” is usually one with stripes of green, red, blue, yellow and brown. Married women also wear some form of head covering as a sign of respect for their husbands. These range from a beaded headband or a knitted cap to fancy beaded headdresses called “amacubi”. Little girls wear beaded aprons or beaded skirts, while older girls who undergo initiation wear many thick “isigolwani” around their necks, arms, legs and waist. 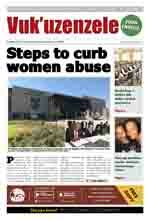 They also wear “isiphephetu”, a beaded apron given to them by their mothers as a symbol of entering into womanhood. 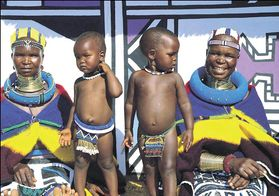 The traditional dress for Ndebele men is not as colourful as that of the women. The main item of clothing for men is a breast-plate or “iporiyana”, which hangs from the neck. It is often decorated with beads around the top and is made from animal skin. The “iporiyana” is a symbol of manhood and is given to a young boy by his father after he has undergone initiation. Ndebele men also wear animal skin head bands and ankle bands. To keep warm, they wear an animal skin ‘“karos” around their shoulders. 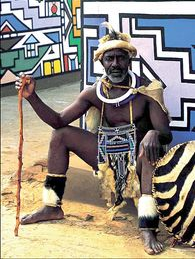 Animal skin traditionally played an important role in men’s dress because each Ndebele group is associated with a different animal. For rituals and ceremonies, Ndebele men wear ornaments made for them by their wives.